Historians of frontier conflict in Van Diemen's Land write with evident sympathy for the island's Indigenous inhabitants who were incrementally dispossessed during the Black War of 1823-1831. However, the initial criminalisation of resistance to colonisation has not been sufficiently scrutinised in the historiography, and existing readings of the 'farcical' trials of four Aboriginal men linked to frontier killings in the mid-1820s tend to focus on questions around Aboriginal amenability to settler law. This article does not rehearse these debates. 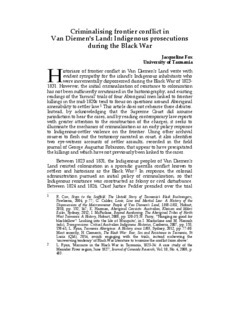 Instead, by acknowledging that the Supreme Court did assume jurisdiction to hear the cases, and by reading contemporary law reports with greater attention to the construction of the charges, it seeks to illuminate the mechanics of criminalisation as an early policy response to Indigenous-settler violence on the frontier. Using other archival sources to flesh out the testimony narrated in court, it also identifies two eye-witness accounts of settler assaults, recorded in the field journal of George Augustus Robinson, that appear to have precipitated the killings and which have not previously been linked to the cases.